The people in this age are not much different from those in the days of Jesus of whom he said: “By hearing ye shall hear, and shall not understand, and seeing ye shall see, and shall not perceive: For this people’s heart is waxed gross, and their ears are dull of hearing, and their eyes they have closed; lest at any time they should see with their eyes, and hear with their ears, and should understand with their heart, and should be converted, and I should heal them.” Matt 13:14-15. Paul also tells us that we should have “sound minds” (II Tim 1:7) so let us logically examine some illogical and unsound beliefs that may border on being called fables and see if we are really open as Jesus said we should be. 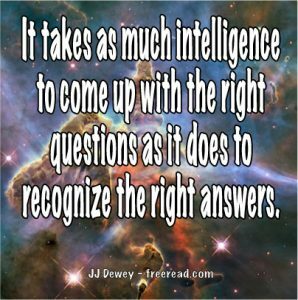 We shall go through a series of questions and answers The questions are designed to make the believer think. The answers are those given by typical believers. Hopefully, these thought-provoking questions will cause the reader to re-examine his beliefs in the light of reason, Biblical truth, and the Holy Spirit. Ask these questions to your orthodox friends. It will drive them crazy. ANSWER: He is a Spirit. QUESTION: Where can I find him? QUESTION: Is God then in the Devil? QUESTION: Then, may I take it that the Devil occupies a space where God is not present? ANSWER: Yes, God could not dwell in such an evil being. QUESTION: Then you do not really believe in a God who is omnipresent, or is everywhere? ANSWER: He surrounds everything and His influence is everywhere. QUESTION: You mean he influences the Devil and surrounds him, but the spot the Devil occupies is a place where God is not? QUESTION: Now the God of the Bible says: “Do not I fill heaven and earth?” Jer. 23:24. David said: “If I ascend up to heaven, thou art there: if I make my bed in hell, behold, thou art there.” Psalms 139:8 Now we are told that God fills heaven, earth, and hell, but the place the Devil occupies He does not fill. Is that correct? ANSWER: I can’t see how God could be in the Devil. QUESTION: But if God is not in the Devil, then He is not really omnipresent is He? At this point the believer usually closes his mind and desires to shut off communication. He does not to follow reason to its inevitable end. Nevertheless, let us continue. QUESTION: God said: “I form the light, and create darkness: I make peace, and create evil: I the Lord do all these things.” Isa 45:7. Do you accept from this Scripture that God created evil? ANSWER: I guess, if the Bible says it. QUESTION: Then did God create the Devil? QUESTION: Is God’s Spirit then present in all of his creations or just part of them? ANSWER: God certainly is not in the Devil. QUESTION: The Bible tells us that there are many devils (Luke 8:30) Is God in any of them? QUESTION: How about wicked men like Nero or Hitler? Is God in them? QUESTION: Then you believe there are many places where God is not? ANSWER: I told you His influence is everywhere. QUESTION: Then do you believe like the Mormons, in a God Who dwells in one spot, but has an influence everywhere? QUESTIONER: But you just said that God is a Spirit that is everywhere. On the other hand, you retracted and said He is not in places of evil. I can then only conclude that you do not believe in an omnipresent God. Here the believer becomes confused and is unable to utter a logical statement. If he is open-minded he may ask: How can God be in the Devil or evil persons? The answer is quite simple. Jesus was with the men who crucified him, but they ignored him and continued to be evil. Similarly, God’s Spirit is everywhere, just as the Bible teaches—even in devils, but evil entities ignore God’s Spirit and may even fight against it. That does not mean that God is not there. QUESTION: Was there a beginning to creation? QUESTION: Then before there was any creation there was only God. Is this true? QUESTION: Then there was a time when there was nothing at all? ANSWER: Yes. Nothing but God. QUESTION: Then God had to make everything out of one of two things: nothing or Himself. Which was it? QUESTION: Does it say anywhere in the Bible that God created everything out of nothing? QUESTION: Then you don’t really know if God made everything out of nothing or Himself do you? ANSWER: I guess I can’t prove it. QUESTION: Is God Something or nothing? QUESTION: Then before there was any creation something did exist and that was God. Is that correct? QUESTION: So if God made the worlds out of anything it had to be Himself, right? QUESTION: This seems logical, since no one has ever demonstrated the creation of something from nothing. After all, do you know how something can be made from nothing? ANSWER: It’s done by the Will of God. QUESTION: But even the Will of God is something, and if we are created from His Will, then we are still created out of God. After all, the Scripture does say that God fills heaven and earth. If God created heaven and earth out of Himself, then He would be everywhere and fill all things, wouldn’t he? QUESTION: But if God created the Universe out of some nothing that was separate from Himself, when did he fill this creation? Was it as the creation was being formed or after it was formed? QUESTION: If God is everywhere, then the smallest particle of matter has to have God in it. If God is in all things, then God has to be all things. Can you think of a logical reason why this is not true? QUESTION: But if God created imperfect beings such as ourselves then God would have to be imperfect, wouldn’t he? ANSWER: No,. God is perfect and created us perfect, but He has given us our freewill and, using this freewill, we make imperfections. QUESTION: But who created your freewill? QUESTION: So we come back to the same conclusion. God created you and your free will in an imperfect state. How can you believe that God is perfect? QUESTION: I notice that animals are also not perfect. Some get sick, others are dangerous and bite people. Did God make them imperfect? QUESTION: So one must conclude that man is not responsible for all the imperfection in the world. Is this right? QUESTION: But you were not created when you were conceived, and we know that nature aborts many conceptions, so even they are not perfect. If God is perfect and you are created at birth by Him, then why are not all babies perfect? COMMENT: The word used in reference to the perfection of God and Jesus was TELEIOO which implies the finishing of a job, assignment or mission. Thus the Bible references of the perfection of Jesus and his Father imply that when they accept a mission they are able to successfully complete it. The word that implies perfection as we use it today in relation top God was the Greek word AKRIBELA. This is the perfection which implies never making a mistake. The interesting thing is this word was never used in reference to Jesus, or even God for that matter. BUT it was used in reference to the belief system of those who crucified the Christ. They saw Jesus as far from flawless and therefore it would be blasphemous to assume that he was the son of God. No creator, not even God manifests flawlessness at the beginning of his work, but when the end is approached then the creation is perfected. QUESTION: Is the Bible the infallible word of God without error? QUESTION: Which version is the perfect version? ANSWER: They all say essentially the same thing. QUESTION: Obviously, you have not studied different translations, for they often have great differences in meaning. For instance, in speaking of the Word of God, the King James reads: “All things were made by Him; and without Him was not anything made that was made.” John 1:3. One version makes it sound as if the Word was Jesus the man. The other version makes it sound as if the Word is a power or an aspect of deity, rather than a man. Do you believe that both of these versions are perfect? ANSWER: Obviously, the King James version is correct there. QUESTION: Then is the King James the perfect version? ANSWER: Actually, the original Greek and Hebrew are perfect. Some versions may distort the Word of God somewhat, but the King James is very close. QUESTION: How about the word “perfect” being mistranslated as we mentioned? ANSWER: I’m not so sure you are correct. All Greek and Hebrew scholars accept the fact that the King James or any other version has some translation that are not accurate. Do you disagree with them? ANSWER: I do not think that God would allow us to have a flawed Bible. QUESTION But which version is the one with no flaws? COMMENT: Obviously, no translation is perfect, for they all disagree with each other in numerous ways. We cannot even say that the earliest Greek and Hebrew manuscripts are without flaw, for we have no copies of the originals, and many things could have been added to or taken away from them. QUESTION: The Scripture also says: “God is not a man, that He should lie; neither the son of man, that He should repent.” Num 23:19. This statement repeats in Samuel which says that God “will not lie nor repent: for He is not a man that He should repent. I Sam 15:29. But in this same chapter, God said: “It repenteth me that I have set up Saul to be king…And the Lord repented that He had made Saul king over Israel.” I Sam. 15:ll&35. We are also told that Moses got God to repent (Ex 32:12-14) and He repented that He made man (Gen, 6;6) and He repented of thinking to destroy Nineveh (Jonah 3:10). How do you explain this contradiction in the Bible and this Bible teaching that God does change? ANSWER: I’m sure that if we went back to the Hebrew here we would see that there is no contradiction. QUESTION: But the Hebrew word telling us that God does not repent is the same as that telling us that He does. How do you explain that? QUESTION: Put them in context then. How do you explain it? COMMENT: There is no way of denying that this is an obvious contradiction or mistake in the Bible. We have no way of knowing how it got there. It could have been corrupted by an early Jewish scribe, or it could have been human error on the part of the original writers. Another alternative is that God does change. After all, He fills the Universe and the Universe is in a constant state of change. Is it wrong to consider all alternatives when looking for the truth? Is it wrong to have our minds open as Jesus commanded? Do we want to believe only preconceived notions of God, or do we want to remain open to learning more about Him? QUESTION: Is God all powerful? QUESTION: Is anything impossible with God? ANSWER: The Scriptures say no. Nothing is impossible. QUESTION: Does this mean that God is able, without exception, to carry out His will? QUESTION: Will all men be saved, or just some of them? ANSWER: Just those who accept the Lord. QUESTION: Then there are some that will be in an unsaved condition for all eternity? QUESTION: But the Scriptures say that God “will have all men to be saved, and to come unto the knowledge of the truth.” I Tim 2:4. God is called “The Saviour of ALL men.” I Tim 4:10. God is “NOT WILLING that any should perish, but that ALL should come to repentance.” II Peter 3:9. Here we are told that it is the will of God that “all” men should be saved. Do you believe that God is powerful enough to fulfill His will in this matter? ANSWER: God has offered salvation to all men, but we all have our freedom of choice. If men do not choose salvation there is nothing that can be done for them. QUESTION: Do you mean that God is unable to fulfill His will because of man’s freedom of choice? ANSWER: He can do anything he wants to, but He has given us a plan and if we do not choose salvation, then we will not be saved. QUESTION: But the Scriptures say that God does want all men to be saved. Let me quote again. God “will have ALL MEN TO BE SAVED.” I Tim 2:4. Is God unable to fulfill his will because of the free agency of man? ANSWER: But it is His will that if we do not obey Him we will not be saved. QUESTION: Where does it say that? QUESTION: Where in the Bible? ANSWER: I’m not sure. I know it is in there. QUESTION: No, it is not in there. But it does say that it is the will of God that all men be saved. Now do you believe that God is able to accomplish His will in this matter? Please answer yes or no. COMMENT: This person believes that God is all powerful in word, but not in deed. On one hand, he thinks God can fulfill His will, but when we read the will of God from the Scriptures, he thinks God’s hands are tied. If God is truly all powerful and it is His will that all men be saved, then in the end all people will be saved. It is as simple as that. The Scriptures tell us that God’s plan of salvation continues after death. (I Cor 15:19). QUESTION: Does God know before a person is born if he will be saved or damned? QUESTION: Then why does God create people that He knows are going to be damned? Wouldn’t it be better for Him to have just not made the damned to avoid all that suffering? ANSWER: We have to come here to prove to ourselves that we can be saved. QUESTION: Do the damned have to prove to themselves that they can be damned? ANSWER: I guess so. I never thought of it. QUESTION: If you were a creator, would you make something that wouldn’t work just so you could say to it: “I made you and I knew even before I made you that you wouldn’t work, but I just wanted to prove to you that you wouldn’t work. Now because you don’t work you are damned for all eternity.” That sounds ridiculous doesn’t it? ANSWER: I’m sure God has his reasons we are not aware of. QUESTION: But we are going by what you claim to be aware of and that is God is all knowing and that He knew who would be damned for eternity. Is there any rhyme or reason why He would create a soul He knew was going to be damned? ANSWER: So we can appreciate being saved. QUESTION: You mean you have to make sure there are others burning in Hell before you can enjoy Heaven? ANSWER: It is God’s plan. QUESTION: If you knew your mother, father and children were burning in Hell for eternity while you were in Heaven, then would this make Heaven more enjoyable for you? QUESTION: Then how does God’s creation of souls that He knew will be damned add to your enjoyment of Heaven? ANSWER: I guess it wouldn’t really. QUESTION: So why did God create souls He knew would be damned? ANSWER: You’ve got me confused. You tell me. COMMENT: The Scriptures tell us that it is God’s will that “All” be saved. As you can see, it would be ridiculous for a Creator to make souls He knew would be damned. What joy would a father have in a son that he knew from the beginning would be a failure? Why would God purposefully produce sorrow for Himself? God loves all His sons and daughters and is going to work with them all until they succeed in salvation just as you would with your children. After all, it is written: “Or what man is there of you, whom if his son ask bread, will he give him a stone? Or if he ask a fish, will he give him a serpent? If ye then, being evil, know how to give good gifts unto your children, how much more shall your Father which is in heaven give good things to them that ask him?” Matt 7:9-11. Sooner or later, all men will want salvation. Why do Christians believe that when many ask for the fish of salvation that God will say: “It is too late, my son. Here, have the serpent of damnation.” Jesus tried to correct this misconception, but who has heard him? God is a man.. God is spirit..God is an exulted and glorified man. God’s spirit is everywhere it permeates thru all, God has a body as it occupies space and time, God is not ethereal. When Christ said be ye perfect as your Father in heaven is, he meant it…Christ was resurrected back into his body that died on the cross [for many scriptural reasons] and this is what he showed the Father after ascending to Heaven and the Father glorified his body after showing himself to Mary and then the apostles except for Thomas at that time. The devil and his cohorts were children of God once but thru free agency and free will to act for themselves they rebelled and their temples became defiled but yet their temples stand? do they not? Wherefore, because that Satan rebelled against me, and sought to destroy the agency of man, which I, the Lord God, had given him. Sounds like you do not buy into the doctrine that God is omniscient.